Photoshop Elements 11 has several simple, manual tools you can use to fix lighting if the Auto tools don’t cut the mustard. The manual tools offer more control for adjusting overall contrast, as well as bringing out details in shadow, midtones, and highlight areas of your images. You can find all lighting adjustments in both Expert and Quick modes. 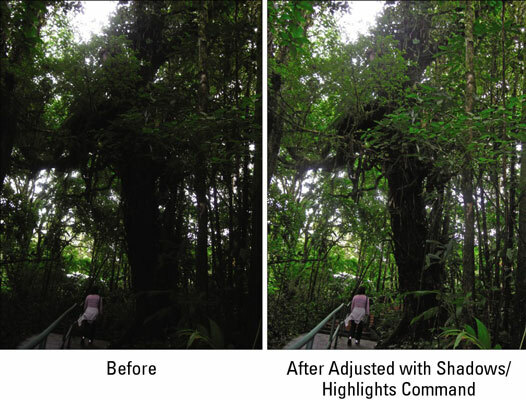 The Shadows/Highlights command offers a quick-and-easy method of correcting over- and underexposed areas. This feature works especially well with images shot in bright, overhead light or in light coming from the back (backlit). These images usually suffer from having the subject partially or completely surrounded in shadows, such as the original image (left). In Expert or Quick mode, choose Enhance→Adjust Lighting→Shadows/Highlights and make sure the Preview check box is selected. When the Shadows/Highlights dialog box appears, the default correction is applied automatically in your preview. If the default adjustment doesn’t fix the problem, move the sliders (or enter a value) to adjust the amount of correction for your shadows (dark areas), highlights (light areas), and midtones (middle-toned areas). Try to reveal more detail in the dark and light areas of your image. If, after you do so, your image still seems to need more correction, add or delete contrast in your midtone areas. If you need to start over, press the Alt key (Option on the Mac) and the Cancel button becomes Reset; click Reset to start again. Click OK to apply the adjustment and close the dialog box. Despite its very descriptive name, the Brightness/Contrast command doesn’t do a great job of either brightening (making an image darker or lighter) or adjusting contrast. The problem with the Brightness/Contrast command is that it applies the adjustment equally to all areas of the image. If you want to use the Brightness/Contrast command, select only the areas that need the correction. After you make your selection, choose Enhance→Adjust Lighting→Brightness/Contrast. You can also find the Brightness/Contrast command in Guided mode. If you want the real deal when it comes to correcting the brightness and contrast (and even the color) in your image, look no further than the Levels command. You can get a taste of what Levels can do by using Auto Levels. However, the Levels command offers much more control. And, unlike the rudimentary Brightness/Contrast command, Levels enables you to darken or lighten 256 different tones. Keep in mind that you can use Levels on your entire image, a single layer, or a selected area. You can also apply the Levels command by using an adjustment layer, a recommended method. In Expert or Quick mode, choose Enhance→Adjust Lighting→Levels. The Levels dialog box appears, displaying its own histogram. This graph displays how the pixels of the image are distributed at each of the 256 available brightness levels. Shadows are shown on the left side of the histogram, midtones are in the middle, and highlights are on the right. In Expert mode, choose Window→Info to open the Info panel. Set the black and white points manually by using the eyedroppers in the dialog box. To do so, first select the White Eyedropper tool and then move the cursor over the image. Look at the Info panel, try to find the lightest white in the image, and then select that point by clicking it. The lightest white has the highest RGB values. Repeat Steps 3 and 4, using the Black Eyedropper tool and trying to find the darkest black in the image. The darkest black has the lowest RGB values. When you set the pure black and pure white points, the remaining pixels are redistributed between those two points. You can also reset the white and black points by moving the position of the white and black triangles on the input sliders (just below the histogram). Or, you can enter values in the Input Levels boxes. The three boxes represent the black, gray, and white triangles, respectively. Use the numbers 0 to 255 in the white and black boxes. Use the Gray Eyedropper tool to remove any colorcasts by selecting a neutral gray portion of your image, one in which the Info panel shows equal values of red, green, and blue. If your image is grayscale, you can’t use the Gray Eyedropper tool. If your image has too much contrast, adjust the output sliders at the bottom of the Levels dialog box. Moving the black triangle to the right reduces the contrast in the shadows and lightens the image. Moving the white triangle to the left reduces the contrast in the highlights and darkens the image. Adjust the midtones (or gamma values) with the gray triangle input slider. The default value for gamma is 1.0. Drag the triangle to the left to lighten midtones and drag to the right to darken them. You can also enter a value. Click OK to apply your settings and close the dialog box. The contrast in your images should be improved. When you click the Auto button, Elements applies the same adjustments as the Auto Levels command. Note the changes and subsequent pixel redistribution shown in the histogram after you click this button.